No matter where tragedy strikes, it always hits close to home. 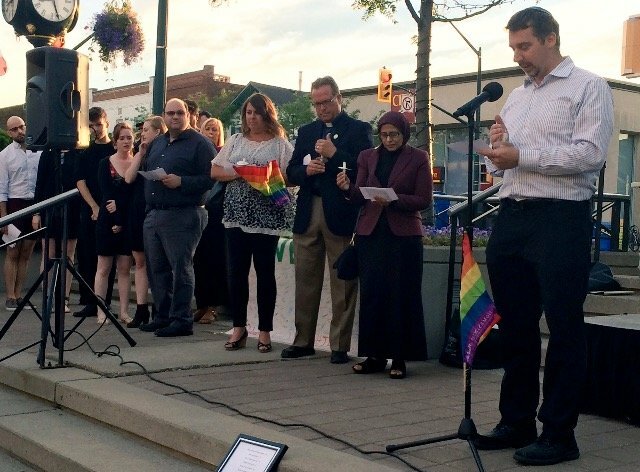 This was evident Thursday (June 16) night at Oakville’s Towne Square, where 250-300 people gathered at a candlelight vigil to remember the victims of the June 12 shootings (49 dead, 53 injured) in an Orlando, Fla., nightclub that mainly catered to members of the LGBT community. 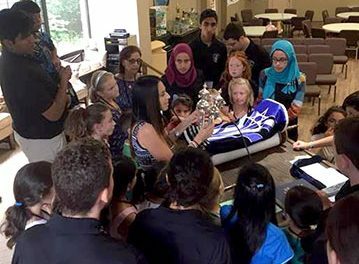 Organized by resident Mason Saunders and Ward 6 Town Councillor Natalia Lishchyna, the half-hour vigil featured performances from Theatre Sheridan students and Jasmine Samadhin, a prayer led by Rabbi Stephen Wise and Interfaith Council of Halton (IFCH) members and other tributes. A group of 10 residents read the victim’s names aloud, which was followed by two minutes of silence as tribute. “Tonight, we stand together to remember Heaven’s newest angels and to commit to ourselves, and each other, that we will be among those who choose to answer violence and intolerance with love and acceptance,” said Lishchyna. The Town councillor said Oakville is a “very caring and loving community,” as shown by the number of people in attendance. “I wish we didn’t have to put this together to honour the victims because nobody wants this kind of thing to ever happen again. We wish it didn’t happen,” said Lishchyna. Samadhin sung Amazing Grace and Theatre Sheridan students performed True Colors, in separate tributes. Dave Comeau, one of five people singing True Colours, is a music theatre performance student at Sheridan College. Having the community come together in solidarity is “incredibly important,” the 28-year-old said, particularly his involvement with other Theatre Sheridan students. 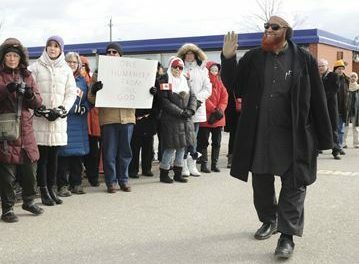 “We just had to make a presence here, given that I couldn’t attend the Toronto vigil. I had to be sure I was commemorating and showing support,” said Comeau. “If you see something happening, be that person, as long as you feel safe, to defend somebody who may be struggling or is a target from someone else. 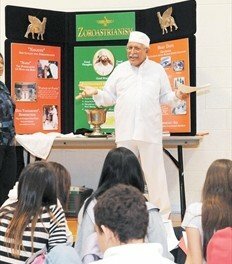 It goes a long way and there is a ripple effect if you help out one person,” said Comeau. Michael Rubinoff, an associate dean at Oakville Sheridan, was heartbroken when he learned of the shootings, which has been tough on the LGBT community, he said. “These are people who probably have overcome adversity and had the courage to come out and live their lives openly. To go to a place where they’re able to do that and celebrate that, to have their lives taken in that way is really tragic and upsetting,” said Rubinoff. He said it was wonderful to have Theatre Sheridan students perform a tribute since the college has a sizable LGBT community, including in the performing arts programs. “We got a group of wonderful students to come here and pay their respects the best way they know how, which is through song,” said Rubinoff. Halton Regional Police attended the vigil with its Pride vehicle on display to show support. To see the large turnout at Towne Square is an indicator of “how healthy a community Oakville is,” said Insp. Nick Milinovich, HRPS Regional Community Mobilization Bureau. “Just being here today is one thing, but working with communities is equally as important. We work with the LGBT community outside of the tragic events to try to make it as comfortable for them in the community as anybody else,” said Milinovich. “We ought to be able to disagree agreeably, we ought to be able to exchange our information and views and arrive at a solution that we can all live with. We ought to be able to work together to create good decisions for our entire community,” said Burton. 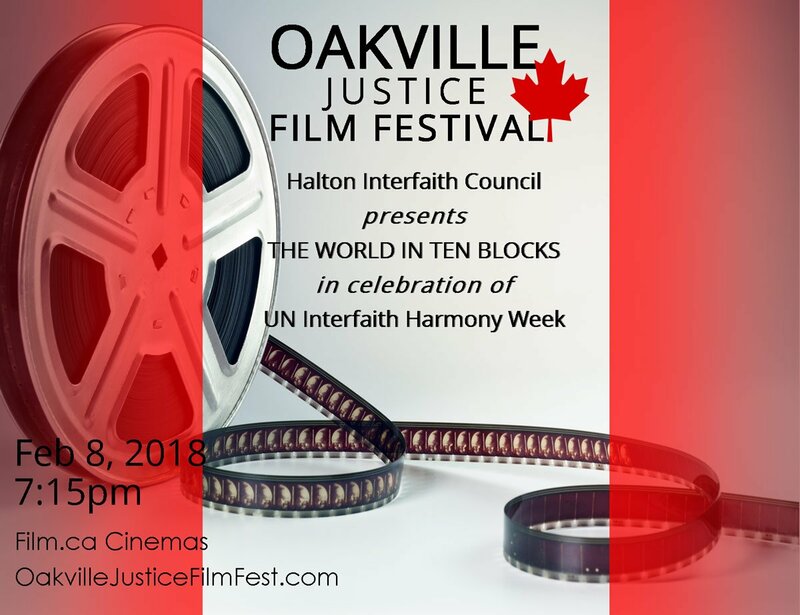 The Oakville mayor read a message written by a 22-year-old man, who “expressed perfectly, everything that we hope for in a better world and everything that’s wrong with what happened,” Burton said. Saunders urged attendees to use their voices “louder than before” to speak for those who cannot. “Although this attack was on all of us, we cannot lose sight or ignore the blatant homophobia embedded in what happened. I cannot speak for the 49 beautiful voices who’ve been silenced, they’re so deeply-loved, but their voices have been taken from us,” said Saunders. Tributes also poured in on social media, with many residents posting photos and messages on Twitter using #OakvilleStandsWithOrlando and #LoveWins. 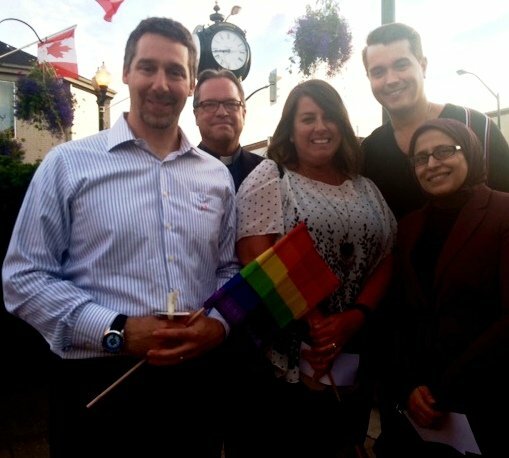 Earlier this week, Town council held a moment of silence at the foot of a Pride flag, raised at Town Hall and then lowered to half-mast to show support.